Eggs are one of the world’s healthiest foods. They contain numerous important nutrients and can provide you with impressive health benefits. Raw eggs do have all the same benefits as cooked eggs. However, eating raw eggs or foods containing them raises concerns about the risk of Salmonella infection. Also, your absorption of some nutrients may be reduced or even blocked completely. Just like cooked eggs, raw eggs are extremely nutritious. They’re rich in high-quality protein, healthy fats, vitamins, minerals, eye-protecting antioxidants and various other nutrients. Vitamin A: 9% of the RDI. Vitamin B2 (Riboflavin): 13% of the RDI. Vitamin B5 (Pantothenic Acid): 8% of the RDI. Vitamin B12 (Cobalamin): 7% of the RDI. Selenium: 22% of the RDI. Phosphorus: 10% of the RDI. In addition, one raw egg contains 147 mg of choline, an essential nutrient important for healthy brain function. Choline may also play a role in heart health (2, 3, 4). Raw eggs are also high in lutein and zeaxanthin. These important antioxidants protect your eyes and may reduce your risk of age-related eye diseases (5). It’s important to note that almost all the nutrients are concentrated in the yolk. The white mostly consists of protein. Bottom Line: Raw eggs are a nutrient-dense food packed with protein, good fats, vitamins, minerals and antioxidants that protect your eyes. They’re also an excellent source of choline. The yolks contain most of the nutrients. Eggs are one of the best sources of protein in your diet. In fact, eggs contain all 9 essential amino acids in the right ratios. For this reason, they’re often referred to as a “complete” protein source. However, eating the eggs raw may decrease your absorption of these quality proteins. One small study compared the absorption of protein from both cooked and raw eggs in 5 people (6). The study found that 90% of protein in cooked eggs was absorbed, but only 50% in raw eggs. In other words, protein in cooked eggs was 80% more digestible. Although protein is better absorbed from cooked eggs, some other nutrients may be slightly reduced by cooking. These include vitamin A, vitamin B5, phosphorus and potassium. Bottom Line: Research indicates protein in cooked eggs is much more digestible than protein in raw eggs. If you eat them raw then your body may not be able to absorb all the protein. Biotin is a water-soluble B-vitamin, also known as vitamin B7. This vitamin is involved in your body’s production of glucose and fatty acids. It’s also important during pregnancy (7). While egg yolks provide a good dietary source of biotin, raw egg whites contain a protein called avidin. Avidin binds to biotin in the small intestine, preventing its absorption (8, 9, 10). Because heat destroys avidin, this is not an issue when the egg has been cooked. In any case, even if you eat raw eggs, it’s highly unlikely it will lead to actual biotin deficiency. For that to happen, you would need to consume raw eggs in large amounts — at least a dozen per day for a long period of time (11). Bottom Line: Raw egg whites contain the protein avidin, which may block absorption of biotin, a water-soluble B-vitamin. However, it’s unlikely to cause deficiency unless you eat a lot of raw eggs. Raw and undercooked eggs may contain Salmonella, a type of harmful bacteria (12). This bacteria can be found on egg shells but also inside eggs (13). Consuming contaminated eggs can cause food poisoning. Symptoms of food poisoning include stomach cramps, diarrhea, nausea, fever and headache. These symptoms usually appear 6 to 48 hours after eating and may last 3 to 7 days (14). Fortunately, the risk of an egg being contaminated is very low. One study found only 1 of every 30,000 eggs produced in the US is contaminated (15). However, from the 1970s through the 1990s, contaminated egg shells were the most common source of Salmonella infection (16, 17, 18). Since then, some improvements have been made in the processing of eggs, leading to fewer Salmonella cases and outbreaks. These changes include pasteurization. This process uses heat treatment to reduce the number of bacteria and other microorganisms in foods (19). The US Department of Agriculture (USDA) considers it safe to use raw eggs if they are pasteurized. Bottom Line: Raw eggs may contain a type of pathogenic bacteria called Salmonella, which can cause food poisoning. However, the risk of an egg being contaminated is quite low. Salmonella infection is more of a concern in certain populations. In some people, it can have serious or even fatal consequences. Infants and young children: The youngest age group is more susceptible to infections due to immature immune systems. Pregnant women: In rare cases, Salmonella may cause cramps in the uterus of pregnant women that can lead to premature birth or stillbirth (21). The elderly: People over the age of 65 are more likely to die from food-borne infections. Contributing factors include malnutrition and age-related changes in the digestive system (22). Immune-compromised individuals: The immune system is weaker and more vulnerable to infections in people with chronic disease. People with diabetes, HIV and malignant tumors are among those who should not eat raw eggs (23). These groups should avoid eating raw eggs and foods that contain them. Homemade foods that often contain them include mayonnaise, cake icings and ice cream. Bottom Line: Infants, pregnant women, older adults and other high-risk groups should avoid eating raw eggs. In these groups, Salmonella infection may lead to serious, life-threatening complications. It’s not possible to completely eliminate the risk of infection from eating raw eggs. However, there are ways to reduce it (24). Buy pasteurized eggs and egg products, which are available in some supermarkets. Only buy eggs kept in the refrigerated food section of the grocery store. Keep eggs refrigerated in your home. Storing them at room temperature may induce rapid growth of harmful bacteria. Don’t buy or consume eggs past their expiration date. Get rid of cracked or dirty eggs. However, the only sure way to eliminate the risk is to cook your eggs thoroughly. Bottom Line: Buying pasteurized and refridgerated eggs can lower the risk of Salmonella infection. Proper storage and handling after you purchase them is also important. However, protein absorption is lower from raw eggs, and the uptake of biotin may be prevented. Most concerning is the small risk of raw eggs contaminated with bacteria leading to Salmonella infection. Buying pasteurized eggs will lower your risk of infection. 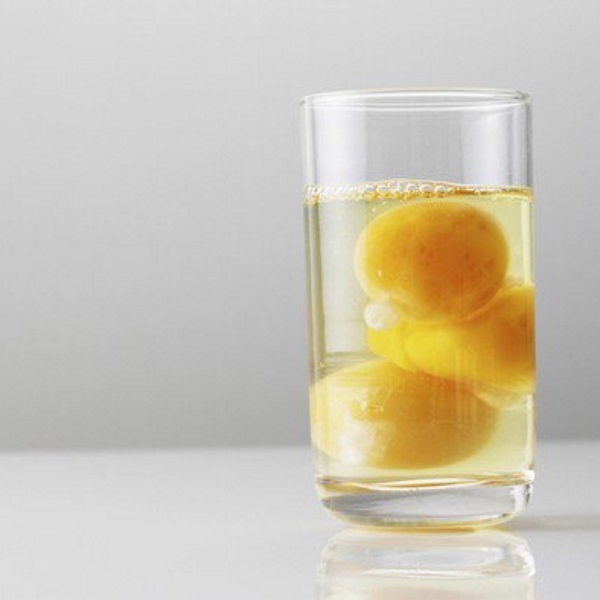 Whether eating raw eggs is worth the risk is something you need to decide for yourself. Just remember that very young children, pregnant women, elderly people and individuals with weak immune systems should not eat them.